These cats came back ... and thanks for that! After completing the Monster tour in Japan last week, logistically, reasonably, realistically and cost effectively, it made no sense to schedule a one-off show 8,007 kilometers away. But, then again ... this is no ordinary band. For you Calgary, the masters of classic shock weren’t about to blow this one off. No damn way. 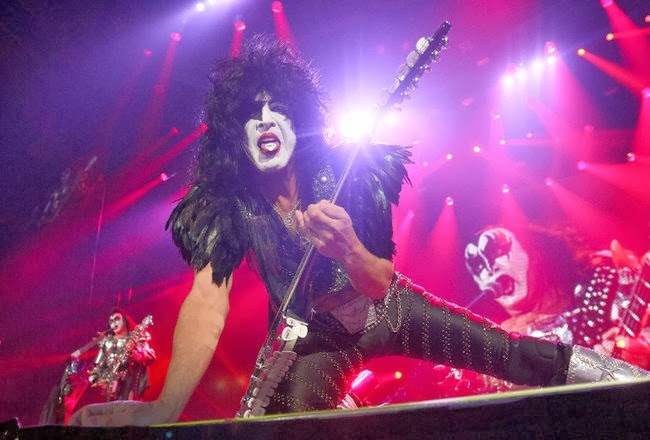 During the third rescheduled Calgary Stampede arena show in the past eight days, KISS proved once and for all that the best kind of fun is big, dumb fun. And you can bet your Originals lunchbox on it. The lights, the smoke, the bombs, the sparks, the blood, the fire, the fans, the spectacle and, uh, some tasty classic rock nuggets, which have stood the test of time rather well, makes the entire experience a memorable one ­— no matter how old or young you are. Listen, if you were nine years old when Love Gun came out in 1977, last night was a can’t miss. What’s interesting was watching the healthy contingent of teens and 20-somethings, jaws on the arena floor, experiencing the obvious magic of KISS for the very first time. Parents there with their grown children, and even grandchildren (many in full kabuki greasepaint) created a warm rock and roll emotion only made possible by a band with a 40-year history. On a massive stage production loaded with all the bells and whistles, all hell broke loose with set opener Psycho Circus (a curious choice when you’re already revved for Detroit Rock City), which quickly segued into the Destroyer classic, Shout It Out Loud. “How ya’ doin’ Calgary? !” singer-guitarist Paul Stanley quizzed the adoring masses, receiving a thunderous roar in return. The wonderfully diverse Calgary edition of the KISS Army cheered long and loud as their heroes launched into Do You Love Me, I Love It Loud and Hell Or Hallelujah from last year’s Monster album. Many of last night’s live song choices may have not encapsulated a fan’s dream set list, but it’s good to know that after 40 years, KISS can still leave you wanting more. Listen, Paul Stanley is a great rock singer — always has been — and Gene Simmons is a great entertainer — always has been. If longevity equates to greatness on some level, it’s easy to answer the question: Why change a thing? Tommy Thayer (guitar) and Eric Singer (drums) are no Ace and Peter, despite the fact that they’re both infinitely more proficient on their instruments. But for anyone who considers KISS more of a brand than a band ... well, you’re just dead wrong. There’s still some great rock and roll in them bones — and you can bet your first-edition KISS comic books on that. The doom-laden Creatures Of The Night nugget, War Machine, brought forth the Simmons fire-breathing routine (it never gets old), followed by Heaven’s On Fire and Calling Dr. Love, before Thayer stole Ace’s old thunder on Shock Me. Simmons was back up to his old blood-hurling tricks leading up to God Of Thunder, followed by the Starchild’s tour de force of Love Gun and main set closer, Black Diamond. The expected encore heavy artillery included Detroit Rock City, the group’s admittedly catchy disco foray, I Was Made For Loving You and of course the fist-pumping anthem of anthems, Rock & Roll All Nite — complete with the inevitable and welcome confetti storm. Opening the show was hard British blues rock trio, Leogun. Taking its cue from the school of Cream, Thin Lizzy and the mighty Zeppelin, these dudes may well have been KISS jamming it out in a rehearsal space in Kent rather than Queens, N.Y. in 1973. Head-shaking frontman Tommy Smith led the serious old-school power trio through heavy duty, soulful and crunchy bursts such as What’s It Gonna Take, Let’s Be Friends, Medicine, Every Day and Piggy In The Middle. No one had a clue who Leogun were at 7:30 p.m. By 8:30, 12,500 people were wondering what the hell had just hit them. Ain’t that what it’s all about?